The perfect balance of sweet & spicy. 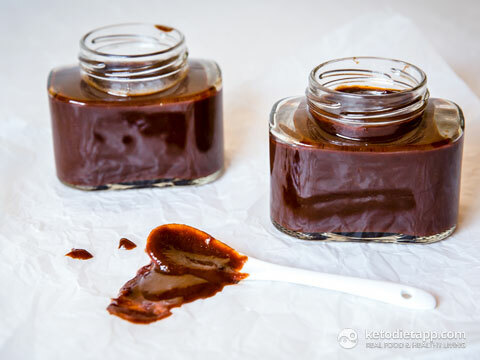 This is the best keto & paleo barbecue sauce you will ever try! The preparation is simple: just mix it, boil it, chill it & store it! If you have my home-made ketchup already prepared, it literally takes just a few minutes to make. It adds an amazing flavour to meat dishes such as BBQ Pork Ribs or even fried eggs which is how I like to eat them! Brian: "... By the way, love the app! Such great, useful information and the recipes are awesome! 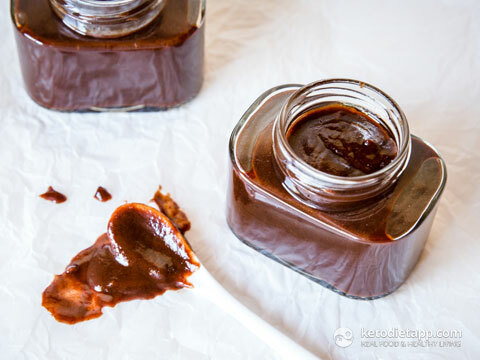 Fat bombs, home-made protein bars and that chocolate BBQ sauce are all new to me and I love them. Keep up the good work!" Instead of the listed sweeteners, you can try other healthy low-carb sweeteners from this list. The reason I'm using both Erythritol and stevia is to mask the aftertaste some of the sweeteners may have. 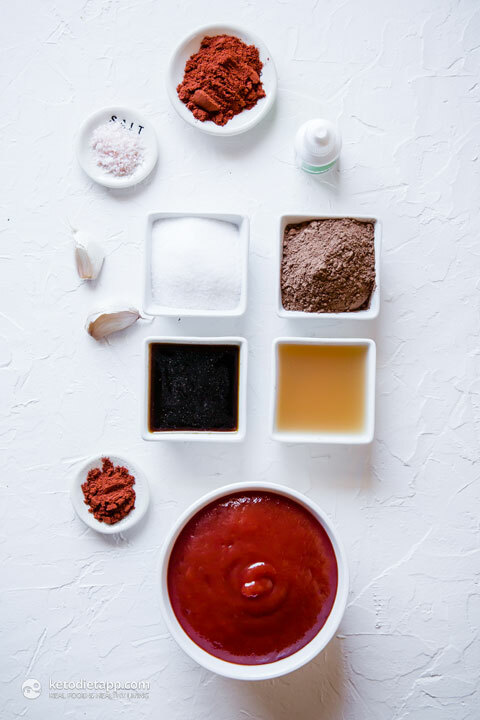 Start by making my low-carb ketchup. Peel and crush the garlic. 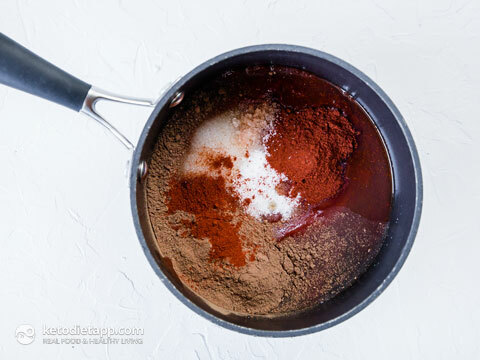 Place everything into a saucepan: the ketchup, butter, garlic, coconut aminos, vinegar, smoked salt, cacao powder, paprika, chili powder, Erythritol and stevia. Cover with a lid, cook for 5-10 minutes over a medium heat. When done, take off the heat. You can adjust the spiciness by using either mild or extra hot chili powder. Coconut aminos is a healthier alternative to soy sauce and is recommended as a healthy substitute on paleo diets. You can use any vinegar you like such as apple cider or white or red wine vinegar or even try making your own fruit vinegar. Transfer in a glass jar and keep in the fridge up to a month or preserve for longer (water-bath canning works best). Done - it's ready to be served! Try with BBQ Pork Ribs and don't forget to also check out my Blackberry BBQ Sauce! 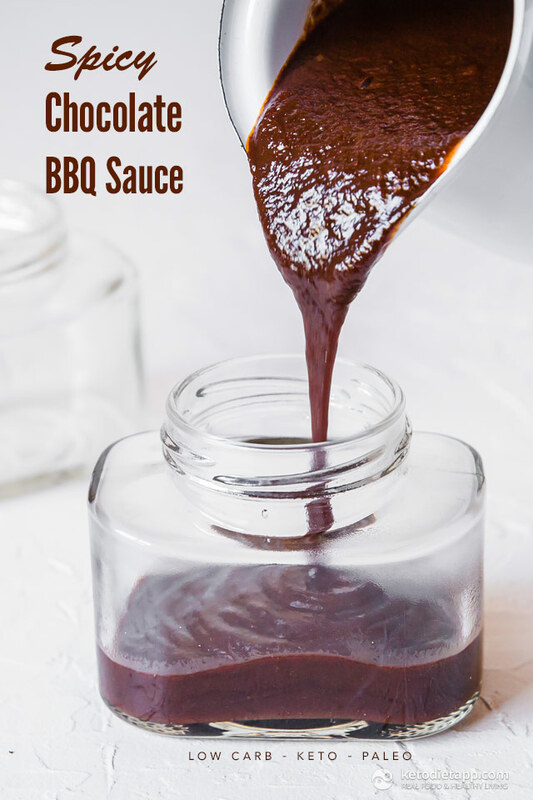 Wow - what a great tasting BBQ sauce. I have been lucky enough to find a tomato sauce (ketchup) made with stevia so it made this recipe super easy to make. I have been LCHF/Keto for the last 6 years & haven't had BBQ sauce since then. This goes so well with my fat head pizza dough sausage rolls! Thank you for all your experimentations - it helps make this way of eating so interesting. Thank you, that's great to know! I'd love to be able to find stevia sweetened ketchup but I haven't seen any (yet). Love the recipe! Unfortunately, I do not have coconut aminos. If I remove it from th erecipe, will it change the overall taste? And if so, what can I use to substitute? Hi Stephanie, you can try tamari sauce (fermented soy sauce that is gluten-free and can be used occasionally) or skip it. I don't know if there is another alternative. I just made this using your homemade ketchup recipe. I added a teaspoon of liquid smoke and used Chipotle chili powder as the chili powder. It was absolutely amazing! Thank you so much for the recipe. I love BBQ sauce but it is so hard to find good low carb BBQ sauce. Wow! Great flavor and I had all of the ingredients at home! Thanks for your amazing work! Love this! Only change I made was to reduce the cocoa powder by half and I used soy sauce because I cant get amnios. Great recipe! I came here looking for a keto version of Sweet Baby Ray's -- something smoky and sweet. This was perfect. I did add 1 tsp. each of liquid smoke and worcestershire sauce, to deepen the flavors. I found your website just yesterday. 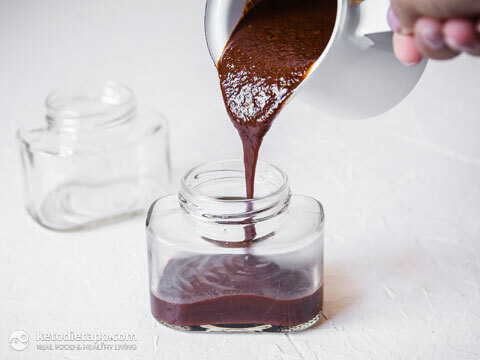 I made your ketchup and then your Spicy Chocolate Barbecue sauce. That sauce is incredibly good. I will be making a pork loin in the crockpot today and am excited to try the barbecue sauce on it. I am so glad I found your website. I have saved you to my favorites and look forward to trying more of your recipes. I was looking for the Spicy Chocolate BBQ sauce recipe. The link brings me to this page, with the recipe for the ribs, but no recipe for the BBQ sauce! Since I'm allergic to tomatoes, I'm gonna try a variation/shortcut here: using Sambal Oelek (which is chili paste with garlic already in it), and going from there. I'll report back. Thank you - sure, please, do!